Here are two well known Elgar works in unfamiliar garb. This is a step further out into the unknown beyond such 'confections' as the Elgar/Walker Piano Concerto. It's not as remote or as ambitious as the Third Symphony, the Sixth Pomp and Circumstance and the masterly So Many True Princesses. It occupies roughly the same territory as the Gordon Jacob-orchestrated Organ Sonata. It is the burden and blessing of some composers that their fans cannot get enough of their music. Demand like that is bound to encourage orchestrations, completions and realisations. So far as British music is concerned both Elgar and Finzi (Songs and Bagatelles) have felt the effects while others including Vaughan Williams have had their early/suppressed works revived. 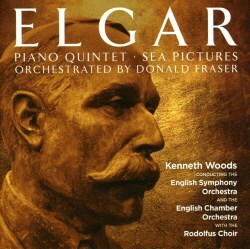 Elgar capitalised on the music of Handel, Bach and Chopin; Donald Fraser and his sponsors skilfully follow a similar path but on much more extensive original works. Fraser has some credentials for orchestrating Elgar. Quite apart from these two major projects he orchestrated parts of the Violin Sonata for a film project, Elgar's Tenth Muse which was shot at and around Brinkwells. The recordings were made by Sir Andrew Davis and the BBC Symphony with Maxim Vengerov. It's an initially disorientating experience to hear Sea Pictures in a version with choir. Mind you, having recently encountered Sea Pictures sung by Larisa Avdeyeva (Scribendum-Svetlanov) in Russian I was already 'softened up'. The Rodolfus Choir are an elite SATB group and have a wonderfully smooth and often lulling sound; there's a lot of that mood in Sea Pictures. The choir's diction is a marvel although the sung words are in any event at the back of the booklet. The singers are attentive to dynamic contrast and register some superbly poetic effects. Open-minded Elgarians who can get over the heresy of unfamiliar forces will find much to enjoy here. Where Corals Lie is a delight and works exceptionally well with choir. A lazy unobservant glance at the details of this disc had me assuming that the Piano Quintet had been re-engineered into a Piano Concerto to join the Elgar/Walker. No such thing. What we have here is something of symphonic proportions and character. While there are some dark and dramatic moments and even some hints of the Second Symphony this now comes across as reflective and in the same territory as Falstaff. The first movement has an air of halting even fearful uncertainty. It's all very smooth though, suave even. A Viennese lilt at 10.00 is one of several instances where things become quite Brahmsian. The second movement is almost Finzian as details entwine much as they do in the woodland Interludes in Falstaff. The finale has its exciting moments but is overall quite nostalgic (5.24), philosophical and regretful. Sea Pictures is an early work while the Piano Quintet is one of that group of chamber pieces from the saddened Brinkwells years. What next when it comes to orchestrating piano quintets? Perhaps an orchestration of Bax's Piano Quintet of 1915 - a work symphonic in scale and bearing. If so it would join two existing Dutton CDs of reclaimed/rescued Bax: the Variations for Orchestra (CDLX7326) and the huge early, unnumbered Symphony (CDLX7308). The liner-note is by the conductor and by Donald Fraser. It's in English, German and French. These two works in new colours should give many more opportunities to hear this music although ironically each requires a greater number of performers than the originals. Of the two Sea Pictures strikes me as the more attractive.